Clicking photos is an addiction, which you can’t let down and whether they are normal photos or selfies, they should be perfect. But your photos aren’t necessarily perfect every time, there are lot of reasons behind that like not having a good quality smartphone with HD camera, background, posing problems and a lot of them. But in this I’m going to solve this problem and make it completely disappear. I’m gonna give you brief information about the best camera Apps for Android. Guys here we have handpicked some of the best camera Apps which are lightweight, so it won’t slowdown your Smartphone and will solve all those above mentioned problems. So just check those apps below. Highly Recommended – How To Capture Someone’s Picture Who Tries To Unlock Your Phone. Camera FV-5 is a professional camera application for mobile devices, that puts DSLR-like manual controls in your fingertips. Prepared to enthusiast and professional photographers, with this camera application you can capture the best raw photographs so that you can post-process them later and get best results. The only limit is your imagination and creativity. This is developed by FGAE and it is rated 3.9 stars on Google Playstore. Smartphone users often click selfies or photos using just one hand and that sometimes becomes a headache for people with big screen smartphones, that’s where taking smooth selfies becomes difficult. So under these circumstances the location of the capture button of the smartphone are very important. What if we tell you all those above mentioned problems can be solved by a whistle, yeah by just a whistle without pressing any button or clicking on the screen. By using this trick mentioned trick clicking smooth selfies will become piece of cake for you. This is developed by DreamBit and it is rated 4.3 stars on Google Playstore. VSCO Cam provides an Instagram like experience, It is comprised by camera with sharing and editing functions. When it comes down to filters then VSCO Cam is the stunning, simply the best. It has tons of cool filters which you won’t find in other camera apps. You can also import already snapped pictures and edit them with filters and presets. This is developed by VSCO and it is rated 4.4 stars on Google Playstore. 1. Multishot – A feature where you can take many pictures with same background. 2. The picture blurred. You can also capture Group portrait, Sequence shot. 3. Removing unwanted stuff from your photograph. 4. Taking quick pictures, like taking 10 pictures in a row quickly. 5. Manual controls like focus, ISO, and shutter speed priority. DSLR camera tries to provide DSLR features into your phone as much as possible. You can adjust every detail of your photo, But only when your hardware supports it. while taking a picture. There is a magnifying glass icon which allow us to zoom photos. Apart from this the App has tendency to click great pictures because of so many functions available. This is developed by Geeky Devs Studio and it is rated 4.0 stars on Google Playstore. Cymera is another one of those camera apps for Android that is already very popular. With over 10 million downloads till date, Cymera ranks up there with the most popular camera apps period. It also happens to be really highly rated as well. Cymera focuses on taking a certain type of picture. Namely, it’s used predominately for taking pictures of people’s faces. It can function as a regular camera app. There are the standard features, filters, effects, and other editing goodness. However, it’s wheelhouse is face shots. There are a completely separate set of features and filters for when you catch a smile in your pictures. This is developed by SK Communications and it is rated 4.4 stars on Google Playstore. 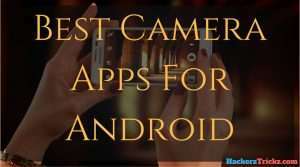 As we all know now there is a trend running of Selfies and we here are sharing post regarding the best camera Apps for Android hence, Here are some of the best camera apps for people who are crazy for clicking selfies and share them on social media. This is one of my favorite camera apps. It removes blemishes and improve skin tone color which makes you look better in the picture. It has an inbuilt photo editor using which you can retouch your photos to adjust skin tone, easily remove wrinkles, erase pimples, edit tired eyes, add filters and reshape your face. One of the best feature is Real-time beautifying filters which means that you can see the effect live while taking the pictures. This is developed by Perfect Corp and it is rated 4.5 stars on Google Playstore. Similar as Youcam but the beautifying filters are little different which makes this app more interesting. There are so many filters which you will love and enjoy while taking selfies. It is a promising camera app which includes features like geo-tagging, live preview of filters, mute mode, custom album viewer, automatic saving and much more. This can be a major break through for people who finds the best camera Apps for Android unusual for all the people who wants a camera App to be more colorful, flashy and which gives a barbie doll kind of feeling. This is developed by JP Brothers, Inc. And it is rated 4.4 stars on Google Playstore. Want to take amazing photos? Stand out from the crowd – make your photos POP! Retrica will transform your photo experience into something truly memorable. Choose how you want to remember that great view from your trip, or that delicious meal you shared with a friend. With Retrica’s live filters, you can preview how your photos will look, before you even take the photo! Millions of users have used this app to capture that stunning scenery, a fun selfie, precious family moments, daring and exciting travel plans, or to make and edit creative artistic photos. This is developed by Retrica, Inc. And it is rated 4.3 stars on Google Playstore. Camera MX is a bit funky camera app. It doesn’t provide a range of features but you can shoot some great pictures and share them on social media with few taps. One of the best feature of this app is shot the Past which lets you capture what actually happened before the picture was captured, It’s quite similar to live photos feature in iPhone 6S. Apart from having a range of features it’s user interface is quite simple and because of that you won’t face any difficulties while capturing some awesome pictures with this App. This is developed by Appic Labs Corp and it is rated 4.3 stars on Google Playstore. Perfect 365 is a perfect solution for self-portraits. It is actually a photo editor which has a wide range of features like applying make-up on your photos, remove skin imperfections, blemishes and you can also add a new hairstyle in few taps. In conclusion, the makeovers look realistic as it detects your key facial points using a smart algorithm. This is developed by ArcSoft, Inc. And it is rated 4.2 stars on Google Playstore. Also Read – How to change font in any Android smartphones. The camera app made especially for Selfies. Also this is an extremely simple camera app aims to strip away any unnecessary features and focuses only on making selfies look more beautiful and fabulous. B612 only uses the front-facing camera and allows you take selfies with one hand as tapping anywhere on the screen will click the picture. The front-facing camera starts up as soon as you start the app, so there are no confusing settings required. A total of 43 filters come with B612, from those that give a gentle feel to those that add a sharp touch to your photos. Have fun choosing the filter that best matches your mood from this selection of filters optimized for selfie taking. This is developed by LINE Corporation and it is rated 4.3 stars on Google Playstore.